One of the leading causes of bridal gown yellowing is the plastic bags that many brides keep their gowns in. Most plastics give off damaging fumes that actually promote yellowing. But, even with proper care, some fabrics will yellow more than others and it may be impossible to prevent all yellowing. Generally, silk fabric yellows more than synthetic fabrics, such as polyester, rayon and acetate. However, nylon, which is a synthetic, has a tendency to yellow more than other synthetic fabrics. Wedding gowns that can be wet cleaned have an advantage, in that if they do yellow, they may be able to be whitened for future use with a fabric whitener. Wedding dress preservation in an acid-free, lignin-free environment, and in the dark is your best protection against yellowing. Padding and wrapping your gown with acid-free tissue or cotton muslin will help to prevent acid migration. Storing your clean wedding gown in an acid-free/lignin-free wedding dress preservation box or wedding gown preservation bag will be best in a dark, interior closet or under a bed. Buffered tissue should be used for wrapping and filling wedding gowns made of synthetic fabrics such as polyester, rayon, and acetate. The buffering agents in the buffered tissue gives added protection against acid migration. But buffering agents may damage gowns made of animal proteins such as silk or wool, therefore un-buffered, acid-free tissue or muslin are recommended for silk fabrics. Some preservation companies advertise that their preservation method will prevent yellowing and they may even offer a warranty. Look carefully at any warranty offered by these companies. One warranty offered by a leading on-line preservation company stated that they will cover discoloration and damages caused by their company’s cleaning and preservation processes. Another simply states that the wedding gown may be returned to a participating dealer for inspection and pressing. None of them state that they will replace an aged, yellowed gown with a new gown. Keeping your wedding gown in the best overall condition should be the primary concern in your wedding dress preservation. So, protect your gown! Get it out of the plastic bag and have it cleaned and preserved in an acid-free environment. Flat storage is recommended for textiles and garments when possible if folding is minimal to fit inside the wedding dress preservation box. Because of the size and dimensions of wedding gowns, this can be difficult. Compromises are often made, usually by folding the gown more than desired. Hanging the wedding dress in a wedding dress preservation bag is a great alternative. Bagged wedding gowns that are hung in a closet have less risk for permanent creasing, and will not need as much maintenance. Keeping your wedding dress in an environment with less than 60% relative humidity will protect it best from mildew and mold growth. Most boxes, including sealed boxes, are not air tight, so you must assume some air will get in. But be certain that moisture does not. If moisture condenses inside a wedding dress preservation box or any container, the gown is at great risk for mildew and mold growth. Wedding dress preservation with a cotton bag has the best air circulation which helps keep the humidity level around the garment constant, as long as it is stored away from moisture. An oxidation spot can occur when a substance that was not properly cleaned on the dress oxidizes and turns brown. This can happen even if your dress has been cleaned as dry-cleaning solvents do not remove all substances. Spills from clear soda or wine and dried perspiration may go unnoticed at the time of the initial cleaning. Unless these substances are pre-treated, it is likely they will oxidize over time. Inspecting preserved wedding gowns periodically ensures the wedding dress remains in the best condition. The sooner an oxidized stain is caught, the more likely it will be able to be removed. 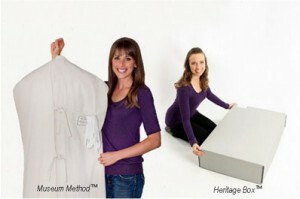 Keeping your wedding dress covered and stored in a dark place will protect it from the damage caused by light and dust. No matter what type of wedding gown preservation you choose, you should keep your preserved wedding gown in a climate-controlled area. Do not be tempted to put your preserved wedding gown in an attic or damp basement where temperatures and humidity levels will fluctuate dramatically. Fluctuating temperatures increase the deterioration rate of textiles. Also, avoid storing your wedding gown or any heirloom garment adjacent to outside walls that do not have an adequate moisture barrier (most older homes do not). Moisture may seep into the wall and onto your gown. Remember, museum conservators recommendations are: Keep it clean, cool, dry, wrinkle free and in the dark.